In honor of Men’s Health Month, I wanted to write a bit about “Men’s Health”. Having no idea where to start, I simply turned to Google. Things that popped out at me from this, their current homepage: 1) Being super-ripped is an awesome way to be, bro! 2) A healthy body is a ripped body, bro! Okay, so I added “bro” bit because I thought it was funny, but here’s my point: aren’t these all incredibly superficial goals? 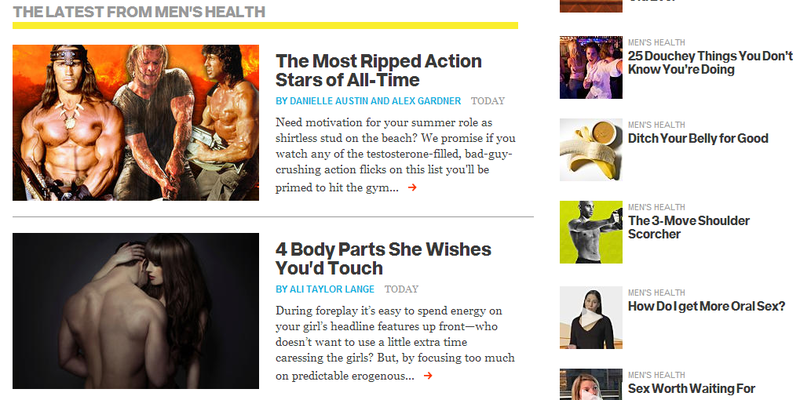 And why is this front page on a “Men’s Health” website? For men, what it means to be healthy sometimes gets lost in the protein-shake and get-ripped craze of our modern society. We are in an unprecedented age of hyper-masculinity and muscle-bound super heroes. Think about it: Captain America, Thor, 300, Batman, Spartacus, and many others feature some of the biggest and most extreme action heroes we have ever seen. Thanks to advances in sports medicine and nutrition, we now have star athletes who are stronger, faster, bigger, and better than ever before. So I ask again: For men, what’s healthy? According to a Today/AOL Body Image Survey released just this past February, 53%, that’s right, over half of men surveyed said that they felt unsure about their appearance at least once a week. To add to that, 41% of men said they worry that people judge their appearance. So guys, if you’ve ever caught yourself having these thoughts, you’re DEFINITELY not alone. But for some men, feeling poorly about themselves goes beyond what’s normal and can become problematic. According to this article, are facing unprecedented levels of men seeking treatment for body-dysmorphia, which causes men to become obsessed with building muscle and perfecting perceived flaws, which are not obvious to others. If you or a friend notices that you’re so preoccupied with your body and appearance that it negatively impacts your social life, dietary habits, other major aspects of your daily life, or you just want an objective opinion without the threat of judgment, you can talk to someone at Counseling and Psychological Services, found in the Campus Health Building at UNC. So, what can you do to improve your self-image? First, start looking inward. Try to be aware when you’re getting caught up in comparing yourself to others. Know that most people don’t have that perfectly chiseled body. Also, try to accept where you are today with your body and even if you aren’t where you want to be. If you don’t currently have a workout schedule, there are many benefits to regular exercise, not just physically but psychologically as well. But, remember, guys, though your goal of being optimally healthy and fit is a great one, try not to fall into the trap of feeling inadequate when you see the idolized images of some “yoked up” dudes online, in the movies, on TV, or in a magazine. These images don’t reflect the real world and is an impractical goal for most of us to achieve. If you take nothing else away from this article, know that you’re really not alone in this, and if you seek out help, it never means that you’re weak or are less of a man. You might even inspire someone else to do the same. If you are interested in exploring masculinity further, check out the UNC Men’s Project. Dennis Carmody is an MPH candidate in the Health Behavior department at the UNC Gillings School of Global Public Health. He is currently enjoying his summer practicum with the great folks at UNC Student Wellness. Previous Article Coffee—Good for you?